Did you know that Louisville hosted the 1954, 1966, 1985, and now the 2002 conventions of the National Federation of the Blind? Many of us recall the '85 convention with great fondness. Betty Niceley was then president of the host affiliate, and the East Tower of the Galt House was a new facility. During that historic convention Dr. Jernigan announced that the coming year would be his last as president of the national organization and that he intended to support the candidacy of Marc Maurer to succeed him. Many things have changed during the seventeen years since our last visit to Louisville. Dr. Jernigan and Betty Niceley, among many others of our colleagues and friends, are no longer with us, and the Galt House itself is preparing for a major round of renovations. Our convention of nearly three thousand this year was very much larger than it was the last time we were in Louisville. In 1985 Ohio took home the attendance banner with a delegation of about eighty-five. This year, with ninety-six registered, Ohio was only eighth in delegation size. Yet despite the changes much was familiar. Kentuckians are still as warm and welcoming as ever. The host affiliate was both charming and efficient. The Galt House staff were friendly and helpful without being intrusive. The Belle of Louisville still loads a few yards from the hotel and plays its calliope while passengers are boarding. Most of all, though the NFB has grown in numbers and complexity, this convention demonstrated that we are still the same intent and focused gathering of the nation's blind that we were in '54, '66, and '85. In short, the mood of this convention was cheerful, confident, and determined. 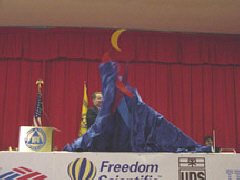 President Maurer draws aside the drape revealing Whozit. Many babies attended their first convention this year; if we tried to list them all, we would leave someone out. But one of the youngest Federationists on hand to meet everyone was not a baby at all. Its name is Whozit, and it is the new logo unveiled shortly after the presidential report on Saturday afternoon, July 6. Whozit is a brightly colored stick figure striding forward holding what appears to be a long cane. From the 2002 convention forward, everything produced by the National Federation of the Blind will carry a version of our new logo. The NFB is the voice of the nation's blind, and we intend that everyone shall come to recognize our vigorous new symbol and associate it with the Federation. Though we found many new faces at the convention this year, some familiar ones were missing. 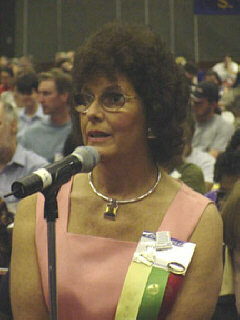 Priscilla Ferris, president of the NFB of Massachusetts and member of the national board of directors, remained at home because of her husband Jack's grave illness. We are deeply saddened to report that Jack died on July 19. Our deepest sympathy goes to Priscilla, her daughters, and their families. We were also concerned to learn that Karen Mayry, president of the NFB of South Dakota, had a foot amputated shortly before convention, and Lucas McQuillan, husband of national board member Carla McQuillan, was hospitalized at about the time he had expected to leave for convention. Karen is back at work, and Lucas is now doing much better and seems to be on the mend. Convention registration opened on July 4 this year, but, as has become traditional, Wednesday, July 3, was filled with activities. In fact, by the evening of July 1, white canes were already in evidence throughout the Galt House and all over the downtown area of Louisville. By Tuesday, the second, hundreds of folks were already busy exploring the public areas of the hotel and checking out the surrounding area for fast food and shopping opportunities. The elevators became busy that day and never again were quiet during our stay. For efficiency's sake, when the elevator cars were full, they bypassed all floors until they reached one requested by a passenger already on board. When people found themselves waiting for long periods and elevators rushing past without stopping, some concluded that a few passengers must know how to override calls from waiting hotel guests and go straight to the floor they wanted. This was not the case. It was just that large crowds take time to move at peak traffic times. And crowds there were all day Wednesday, July 3. 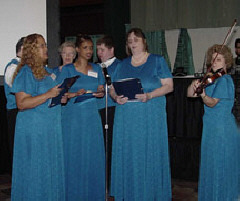 Division-sponsored seminars for blind entrepreneurs and musicians; eight different technology workshops offered by the International Braille and Technology Center for the Blind; seminars on getting foundation grants and making the best use of the Braille Is Beautiful curriculum, led by the NFB director of special programs Betsy Zaborowski; Job Fair 2002, which brought together job seekers and employers; training sessions for technology users offered by product producers; an orientation and mobility conference for those interested in structured-discovery instruction and performance-based certification; various committee and division meetings; and even an organizing meeting for those interested in travel and tourism: this is a sample of the activities available for those not engaged in unloading the truck and setting up the exhibit hall. 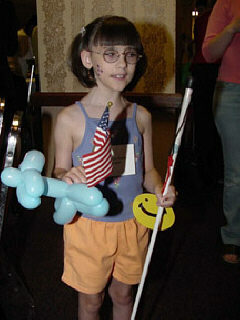 Rebecca Budney (Michigan), age seven, is clearly enjoying herself at the Braille Carnival. This list also omits the wide range of events conducted for families and educators of blind children. Each year the activities organized by the National Organization of Parents of Blind Children (NOPBC) becomes more ambitious, and experience makes them more successful. Following registration, the first session of "The Serious Work of Play," this year's NOPBC seminar topic, was aimed at the entire family. Then the kids went off to the Braille Carnival, where fifty volunteer Braille Buddies were waiting to accompany them as they had fun at stations where they could learn and use Braille in various games and activities. Parents enjoyed two hours of formal presentations in the morning session of the seminar before everyone gathered for the short bus trip to the Kentucky School for the Blind for a box lunch and an afternoon of fun-filled activities. Twenty blind kids made metal masks in an art activity led by Angela Wolf, student division president. The gym was very hot, but that didn't stop the kids from enjoying goal ball and other active play. In air-conditioned kitchens blind cooks showed kids and parents how to have fun cooking. Families moved from session to session in which no one could tell when the learning stopped and the play began. 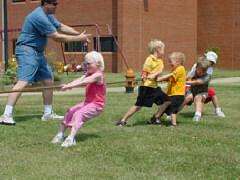 Kids enjoy the old favorite game of tug of war. That evening teens were invited to individualized discussion groups to talk about issues of importance to them. Parents and younger children enjoyed informal discussion and exploration of a display of Discovery Toys. Meanwhile the host affiliate was sponsoring Welcome to Kentucky, an evening of dancing to popular music from the fifties to the present played by a DJ. For those who like to perform or to watch others do so, BLIND, Inc., sponsored Karaoke Night, which also drew large crowds. 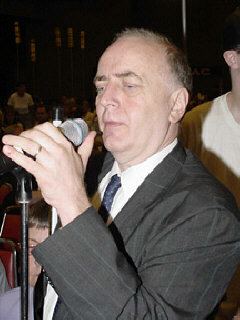 President Maurer was one of the performers at Karaoke Night. He sang, "The Preacher and the Bear." 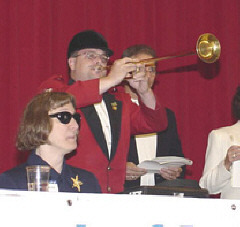 He is pictured here at the microphone with Joyce Scanlan looking on. Registration day started early with lines that moved faster than ever. Sensory Safari and the exhibit hall opened at about the same time, and the crowds swirled among activities and displays all day long. The exhibit hall was full of interesting displays: sixty-four outside or individual exhibitors and thirty-four organizational exhibitors. By the close of the day, more than two thousand people had registered for the convention--not quite a record, but almost. The Resolutions Committee met early Thursday afternoon and considered twenty-six resolutions, twenty-three of which it passed on to the Convention for debate and vote later in the week. A full report of the resolutions considered appears elsewhere in this issue. Following resolutions, the fifth annual mock trial took place before almost four hundred observer/jurors. Each year the National Association of Blind Lawyers, with a little help from its friends, reenacts a case from Federation history. The intent is to entertain and instruct members about a piece of our legal history. This year the subject was the Norwegian Cruise Lines case, in which a blind couple was told that a sighted person would have to be present in their cabin during their honeymoon cruise in order to ensure their safety. Neither bailiff Peggy Elliott nor Judge Charlie Brown could have been said to keep a firm hand on opposing counsel, so the entertainment value of the testimony was quite high, and everyone went away clearly remembering the nonsense argued by the defendants and rejoicing in the real-life victory for the good guys in the original case. Some of the most stimulating and informative activities at convention take place during division meetings. As the years go by division agendas become more and more exciting. The student division, pictured here, always has a large and exuberant audience. Thursday evening and Friday afternoon and evening were filled with division meetings, seminars, and committee meetings of every kind: ten Thursday evening and twenty-two Friday afternoon and evening. Here are a couple of highlights: the Agricultural and Equestrian Interest Group approved a constitution and elected officers to become a division as soon as its constitution is approved by the NFB board of directors. The West Group, creator of Westlaw, the most important online legal database, was present at the convention most of the week and was clearly interested in improving access to its database for blind legal professionals. The teen drop-in room, jointly sponsored by Blind Industries and Services of Maryland and the National Organization of Parents of Blind Children, was a great success throughout the week and did a booming business Thursday afternoon, as well as other times. As usual Carla McQuillan and her staff did a superb job all week with NFB Camp, the childcare facility available to parents during the convention. NFB Camp continues to be a wonderful place for children to explore and play together and for teens to volunteer their time to help. It also frees parents to take advantage of convention opportunities they would otherwise miss. 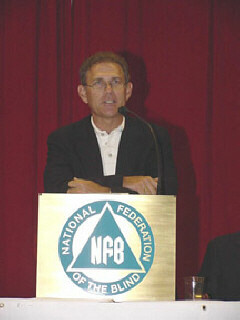 Mr. President, members of the board, and friends, I have been a member of the NFB for thirty-seven years. I have held office in several chapters, divisions, and state affiliates, and I have served on this board for more than a decade. I have chaired a number of committees and served on more, and I have done my best to carry out responsibilities and assignments as asked. I have recommended that we take on projects, knowing that a number of responsibilities to carry them out would come to me. Through the years I hope that my contributions have been worthwhile, and I know that I have received a huge amount of payback in education and love from others in the Federation. This is valuable to me beyond measure, and I will continue to do as much as I possibly can for the Federation and for the blind. However, during the past few years and especially this year I have found it necessary to back out of some of the tasks that I would have liked to do. I have found myself spread so thin that I fear the quality of my work has not always been as high as I wanted it to be. Besides that, I have worked throughout the country, and I have had the privilege to get to know many new, young leaders who in my judgment are ready to take on more important responsibilities in the Federation. Therefore, Mr. President, I'd like to ask that my name not be placed in nomination for a position on the board at this convention. I repeat that I am not done with my Federation work--far from it. I look forward to many years of Federation activity to come. You'll be seeing me around the country, and I'll continue to try to promote new voices and find new hands to carry the load. But I believe that I should no longer serve as an officer or on the board of directors at this time. Thank you, Dr. Maurer, my colleagues on the board, and fellow Federationists, all of my friends. It's a pleasure to be here; this is my thirty-second consecutive convention. I joined the National Federation of the Blind in 1969, and the very day I joined I was elected to an office in this organization. I was not sure that had happened to me, but I found out that it had. I'm glad that it did. I have had such wonderful opportunities over all of these years. I have been able to work with the Federation and watch us grow, watch us celebrate the progress that we have made and set our plans for the future. I feel more fortunate than almost anyone I know, which is not to make any of the rest of you feel poorly--but I feel very fortunate. 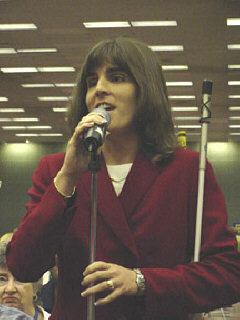 I was first elected to the board of directors of the National Federation of the Blind in 1981. 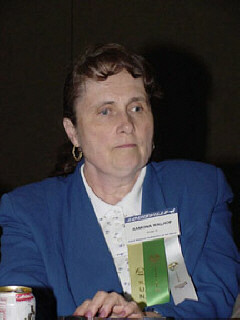 I became secretary of the National Federation of the Blind in 1985 and treasurer in 1988. I have served to the best of my ability. I have had the pleasure of working with tens of thousands of our members and friends around the country. I have worked in the fifty states, the District of Columbia, Puerto Rico, and some other places. I have had much good fortune. 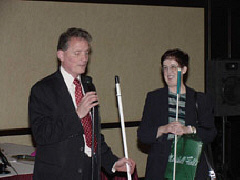 In the recent past I came to Dr. Maurer and said that I thought that it was time for me to step aside, not from the Federation, but from the job as treasurer of the National Federation of the Blind. I will not seek reelection. I simply want to thank you for the honor that you have bestowed on me, the support you have given me and tell you that I expect to see you often and everywhere. Thank you, Mr. President. Dr. Maurer, fellow members of the board, fellow Federationists: I have enjoyed the opportunity to serve in this organization. I have appreciated the opportunity of learning and growing from my Federation family. I joined the Federation twenty-six years ago, and in many respects my life began then. I've had the privilege of serving on this board for five years. My term does not expire till next year; however, as a result of a combination of circumstances, I feel the need to focus on my family and at this time would like to submit my resignation from the board, certainly not my resignation from the Federation or from the Federation family. I will continue to serve wherever I am called upon to serve. I have particularly appreciated the opportunity to attend many state conventions and get to know my brothers and sisters in other states. I have learned and grown from every convention and every seminar I have attended and have participated with a learning spirit. I leave the board with mixed emotions but appreciate the opportunity to serve wherever you would like me to, sir. Thank you. Dr. Maurer warmly thanked all three for their leadership on the board and their devoted service to the organization and assured them that we depend on their continued leadership. President Maurer next briefly reviewed convention plans in the next several years. In 2003 convention rates at the Galt House are $57 for singles and doubles and $63 for triples and quads. Convention registration will take place on Sunday, June 29, and the closing day of the convention will be Friday, July 4. In 2005, also at the Galt House, the rates will be $59 for singles and doubles and $64 for triples and quads. The dates will be Sunday, July 3, to Friday, July 8. 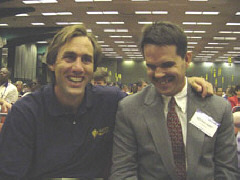 President Maurer then announced that in 2004 we will return to the Atlanta Marriott Marquis Hotel with convention rates of $59 a night for singles and doubles and $65 for triples and quads. Convention registration will open on Wednesday, June 30, and the convention will adjourn on Monday, July 5. Mindy Fliegelman, representing the Jewish Braille Institute, gave a brief report on JBI's new arrangement with the National Library Service as an affiliated library, which will mean that JBI's Braille collection will be maintained by NLS and can be borrowed from either JBI itself or cooperating libraries in the NLS network. JBI is about to increase its Hebrew Braille collection because Duxbury's Hebrew Braille translation program is almost ready for use. As soon as it is, borrowers will be able to request publications on paper rather than the familiar plastic pages. The twenty-second volume in the Kernel Book series of paperbacks was officially released when Dr. Maurer read the introduction aloud to the audience. The book is titled The Summit and addresses itself in part to the events surrounding Erik Weihenmayer's successful climb last year of Mt. Everest. Another book available at the book table this year is Reading by Touch--Trials, Battles, and Discoveries, by Pamela Lorimer from England. She described her book briefly, pointing out that biographies of Louis Braille are quite different in France, the United Kingdom, and the U.S. In the book she examines both the man and the code, particularly during the early years, from all perspectives. Jim Gashel, NFB director of governmental affairs, brought Jim Vollman from the Center for American Jobs to the microphone to announce a strategic partnership between the two organizations. Mr. Vollman was instrumental in the development of our America's Jobline� service, which offers telephone access to all the jobs listed on America's Job Bank. Beginning in August interviews for every job category in the Jobline� list have been created, enabling callers to prepare an online r�sum� based on their individual profiles if they are interested in applying for a job. A Spanish version of Jobline� will also shortly be available. President Maurer then reminded people that we regularly distribute Braille books to blind children interested in receiving them. Another organization supplies the books, and we circulate them. Those interested in adding children's names to the recipient list should contact Barbara Cheadle, president of our parents division. Steve Benson, who chairs the Blind Educator of the Year Selection Committee, came to the podium to make this year's presentation. The plaque and $1,000 prize went to Mary Willows of California. A complete report of this presentation appears elsewhere in this issue. Sharon Maneki, who chairs the Distinguished Educator of Blind Children Selection Committee, presented that award to the 2002 recipient, Debbi Head of Missouri. A full report of this presentation appears elsewhere in this issue. Throughout the morning people chairing fundraising committees and programs within the organization came to the podium to make reports of activity as of the beginning of the convention. Various announcements were also made about convention activities. Jim Omvig, a longtime Federation leader and president of the National Blindness Professional Certification Board (NBPCB), came to the podium to present the first Fredric K. Schroeder Award for outstanding work in the orientation and mobility field. The recipient was Roland Allen of Louisiana Tech University and the Louisiana Center for the Blind. A complete report of this presentation and Mr. Omvig's remarks about the establishment of this award appear elsewhere in this issue. President Maurer made an important announcement following the NBPCB presentation. As of July 29 Ron Gardner has been named the director of the Professional Development and Research Institute on Blindness at Louisiana Tech University. Dr. Fred Schroeder had been the part-time director of the institute, but the program is growing quickly and clearly requires a full-time director. Ron Gardner, who is president of the NFB of Utah, has no plans at present to move to Louisiana but will undoubtedly be giving the airlines plenty of business. Late in the meeting this year's thirty scholarship winners came forward to introduce themselves to the organization. A full report of the scholarship program and awards appears later in this issue. Gary Wunder then presented the Distinguished Service Award to Ed Bryant, editor of the Voice of the Diabetic and president of the Diabetes Action Network. A full report of this presentation appears elsewhere in this issue. Tom Stevens, chairman of the Associates Committee, made the final report of the morning. The top associates recruiters were Art Schreiber of New Mexico, who enrolled 274 NFB members-at-large as associates, and Patricia Maurer of Maryland, who raised $5,319 in this program. Steve Buttleman, dressed in full regalia, plays the familiar race day bugle call. In addition to all the afternoon and evening activities already mentioned a couple of others were of special note. At 5:30 p.m. the first ever Oneg Shabbat, celebration of the Jewish Sabbath, organized by several Federationists, took place. The event was so popular that the group plans to conduct it again next year. First Step Forward, an original play by Jerry Whittle, had two performances Friday evening with proceeds going to fund the Buddy Program at the Louisiana Center for the Blind. LCB students, alumni, and friends comprised the cast. At 9:30 sharp Saturday morning the gavel fell, opening the 2002 convention. When host affiliate president Cathy Jackson came to the microphone to welcome conventioneers, we had no idea what to expect. The ceremonies began with a rendition of "My Old Kentucky Home" sung by the Generation Singers. Before the audience had time to settle back into their seats, Steve Buttleman, the bugler at Churchill Downs, appeared in full regalia to play the familiar fanfare that opens every race meeting at the home of the Kentucky Derby. As the notes of the fanfare died away, we suddenly heard the voice of Paul Rogers, broadcaster of therace of the day on Louisville's WHAS Radio. He narrated a race at Galt House Downs with such runners as Door Prize Diane, Jernigan's Journey, Dr. Marc, Capital Campaign, Have Cane Will Travel, Give Me Braille, Conventioneer, Scholarship, and Erik's Big Climb. The commentary was backed up with the sound of horses galloping, and the comments were filled with puns and wicked little plays on words. Sir, if I may beg your indulgence for two minutes. Since the last time I answered this roll call, a lot has changed for us as Americans and for me personally. On September 11 New York was seriously affected as everyone knows by a terrorist attack on our nation. Many Americans suffered that day and continue to suffer, among them blind Americans. I need to remind this convention and thank you, sir, that the first people on the scene with any aid to blind New Yorkers was the National Federation of the Blind. Also it is through the efforts, the good offices, and the respect in which government agencies hold the National Federation of the Blind that aid continues to come to those blind New Yorkers who continue to be seriously negatively impacted by the terrorist attacks on our nation. The terrorists who attacked New York, the World Trade Center, and the Pentagon seriously underestimated America, not unlike the way society has underestimated blind people. Americans will prove the terrorists wrong; the National Federation of the Blind will prove society wrong. America will emerge bigger, better, and stronger from this, and we as a Federation will, when we finish our National Research and Training Institute, emerge bigger, better, and stronger for this also. On a very personal note, sir, since February 22 many things have changed for me and my family. That was the day, after a long illness, that my wife Sally passed away in the evening. I had just returned from a trip to take two dozen of our teenagers to the National Center--a trip made at her urging. She had been in the hospital for a month and insisted that I go to this event with our kids. (I guess that I can say, "Federation to the end.") We in leadership have all said publicly that we are a Federation family, and our detractors say, "Sure you are. That's a lot of rhetoric." I am here to tell you that is not rhetoric. After February 22 my children and I didn't realize how big our family was. Calls and telegrams and condolences and words and hugs and you name it came from all over this country to me and my family. It just puts the lie to anyone who says that we are not a family. We are a philosophy; we are a civil rights movement, yes sir. But the reason we can sustain this is that we are a family. [applause] So, Dr. Maurer and fellow delegates and fellow Federationists, on behalf of myself and Linda (Sally's sister who is here with me today) and Sally's other sister and my children Brad and Christine, who are at home, I want to thank our family for being our family. God bless America, and God bless the National Federation of the Blind. Thank you, sir. The opening general session concluded at noon, and the afternoon session began promptly at 2:00 p.m. with Dr. Maurer's presidential report, which appears in full elsewhere in this issue. These reports are always exciting and impressive reviews of what the organized blind have accomplished in the year since the last convention. This report was no exception, but it was only the beginning of a very lively afternoon. 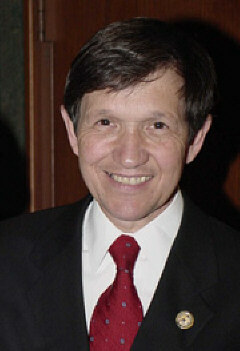 Congressman Dennis Kucinich, Democrat representing the tenth district of Ohio, had the unenviable task of following President Maurer. Mr. Kucinich has a 100 percent favorable record of supporting issues that the NFB advocates, so he was welcomed warmly and expressed his continuing support for the legislation we care about. The next agenda item was a combined presentation by Chris Matthews, host of MSNBC's "Hardball," and Frank Luntz, president of the Luntz Research Companies. Matthews, a Democrat, and Luntz, a Republican, brought the same message. They believe that since September 11 Americans have become more interested in authenticity and getting the job done. They care more about family and freedom, and they are looking for community. Both men urged NFB members to call Congress with our concerns, visit their offices, bring along reporters, present awards when possible--all these things will help us get our message heard and acted upon. Members of the audience examine the replicas of Whozit passed out to everyone present. Later people discovered that clapping with Whozit in one hand made a very interesting sound. The convention then turned our attention to an enigmatic agenda item titled "Whozit." The word had been scattered randomly through the convention agenda, and no one would say what it meant. President Maurer explained that Whozit is our new logo, a vibrant, vigorous symbol to identify the National Federation of the Blind from now on. Dr. Maurer urged that every segment of the NFB now adopt this logo for its own to identify all our activities as part of the whole movement of the organized blind changing what it means to be blind and speaking as the voice of the nation's blind. We will use the month of October as an opportunity to engage in activities that will enable our neighbors to meet the blind in Meet-the-Blind Month. Elsewhere in this issue is the text of the campaign guide for making the most of such opportunities. Each affiliate and division received a kit of materials to assist with this project. Along with other materials was a brand new video called Meet the Blind in Our Voices. It is a powerful and lively fourteen-minute video suitable for showing to civic organizations, classes, church groups, and other groups during October or any other time. At the close of the video President Maurer can be seen striding along using his white cane. Gradually his image morphs into Whozit, a transformation that underlines the vigor of this logo. As part of this program item, volunteers passed out blocks of firm, resilient foam, gold in color, with a raised representation of Whozit in blue on one side and the entire NFB logo printed in black on the other. The colors in the full-color Whozit, by the way, are gold, blue, red, and purple, with the letters "NFB" in black and the words "National Federation of the Blind" in gray. The final item of the afternoon was an address by Judge Richard Teitelman titled "A Blind Jurist in the Highest Court in Missouri." Judge Teitelman outlined his struggles with discrimination and told the audience how he works on Missouri's Supreme Court to see that justice is done. He also answered questions from the audience. Marsh Smith and Susan Feazell dance at the Bluegrass Ball. When the session recessed, delegates scattered to an evening full of meetings and activities. One of the most popular was the Bluegrass Ball, with music provided by the Ovations Orchestra. The dance floor was filled all evening long. Yet not everyone was there. The Showcase of Talent boasted twenty-three acts and an enthusiastic audience. Barbara Hadnott, vice president of the NFB of Mississippi, conducted a workshop on "Choosing Your Best Attitude," and the Jacobus tenBroek Fund auction also took place that evening. A number of useful and valuable items were put on the auction block. The one most sought after was four bottles of wine from Dr. Jernigan's collection. 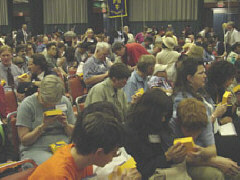 The Sunday morning general session began with the annual election. Since both Ramona Walhof and Allen Harris had declined to have their names placed in nomination as officers and Bruce Gardner had resigned from his position on the board, the report of the Nominating Committee was awaited with great interest. The following names were placed in nomination by the Nominating Committee and were elected by acclamation: Marc Maurer (Maryland), president; Joyce Scanlan (Minnesota), first vice president; Peggy Elliott (Iowa), second vice president; Gary Wunder (Missouri), secretary; Charles Brown (Virginia), treasurer; and board members Pam Allen (Louisiana); Steve Benson (Illinois); Sam Gleese (Mississippi); Diane McGeorge (Colorado), Carla McQuillan (Oregon), and Carlos Servan (Nebraska). Cathy Jackson (Kentucky) was elected to complete the Gardner term. At the close of the election President Maurer made an important announcement. He prefaced it by saying that part of this organization's success has been that we plan for the future. While Dr. Jernigan was still fit and healthy, he stepped aside and supported Dr. Maurer for the position of president. Dr. Maurer went on to point out that he is now fifty-one and expects to be able to serve with vigor for many more years. But we must face the possibility that accident or illness might alter that expectation, and in such a case he wished to tell the convention that his preference for his successor would be Fred Schroeder. They have worked together closely, and he has faith in Dr. Schroeder's ability and commitment to the NFB and all it stands for. Dr. Schroeder is now forty-five, so, if President Maurer does serve until the usual time of retirement, Fred Schroeder would not be a practical candidate to succeed him, but for the next decade or so this would be his choice. "The Digital Future: A Pr�cis" was the title of the presentation by the National Library Service for the Blind and Physically Handicapped. 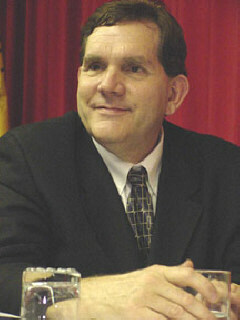 Frank Kurt Cylke, director of the program, has been attending our conventions for more than twenty-five years. This year he asked Michael Moodie, Research and Development Officer for the National Library Service, to make the substantive part of the presentation as the senior member of the staff personally involved in guiding the NLS through the transition to the next generation of Talking Books. Mr. Moodie said that this effort has a foundation and three pillars. The foundation is the digital standard for accessible recorded materials, and this is now established and generally agreed upon. About 5,000 digital books that meet the standard are in the NLS collection today. The goal is to have 20,000 digital books in the collection by 2008, when the transition will officially be made. Book producers are beginning to be required to produce books digitally, and in three years all such books should be digitally recorded. Plans to develop the machines to play the new generation of NLS books are underway, and design ideas and requirements will soon be handed over to a design firm, which will work with sophisticated users to create and test the machine. Flash memory will be used, at least at first, as the technology to circulate books. These chips can be used in solid-state cards and machines, which will be far less fragile than CDs and CD players would be. The Internet may eventually be the delivery method of choice, but not for some time since using it is still too slow and expensive and requires too much expertise for ordinary users. During a brief question period Mr. Moodie assured his listeners that variable speed will be built into the new system and that portable units will undoubtedly be on the market shortly after the changeover. He also said that a panel of users is charged with ensuring that the design of the new playback machines will be intuitive and simple so that older borrowers can use them easily. Eileen Curran, chairperson of the Braille Authority of North America and director of education for National Braille Press, addressed the convention on "The Unified English Braille Code" (UEBC). She began by evoking our memories of three Federation leaders who, before their deaths, had been staunch supporters of the UEBC. She then reviewed her reasons for believing that adopting this unified code is important. Without doing so, she said, truly literate Braille users will be forced to master the computer Braille code as well as the Nemeth and literary codes. Today back-translating from Braille to print is fairly sophisticated, but the ambiguities in the code still lead to mistakes and confusion when a computer is doing the job. The need for better translation from Braille to print in math and science for school students is very great now that students are being held to the standards of their sighted classmates. With the UEBC such problems would be solved. The computer and math codes of the Braille Authority of the United Kingdom, which is the other major Braille authority in the English-speaking world, are very different from ours, so Braille readers from those countries coming to the U.S. must learn two new codes if they are to study math, science, or computer science here. She fears that, if we turn away from the UEBC and the BAUK continues to work toward it, the divide between these two groups will widen. She urged her listeners not to put the brakes on UEBC researchers. They need to continue to learn what makes reading Braille faster and easier to teach. 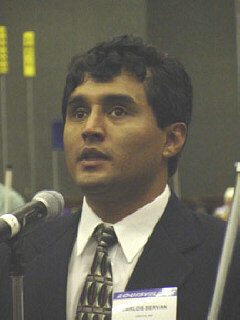 Abraham Nemeth was given an opportunity to respond. He stated that the UEBC does not work for any but the most simplified math, science, or computer uses. For complex materials it is much too bulky. As things are going, BANA is preparing to surrender its responsibility for North American Braille users, the largest Braille-reading population in the world, to the International Council on English Braille, where BANA will have only one vote. Braille should be left to evolve as it has always done. The next speaker was our own Dr. 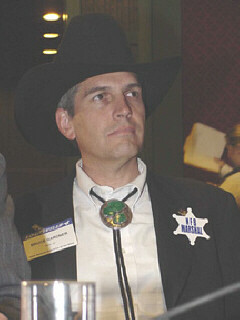 Norm Gardner, a professor at Utah Valley State College. His title was "Researching Reading Speeds for Braille Grade I and Braille Grade II." He reported on some research he has done comparing Grade I Spanish readers and Grade II English readers. The Grade I readers in his small sample read more characters per minute than Grade II readers do. He hypothesizes that we continue to translate Grade II symbols long after we learn them, just as second-language speakers do with speech in the second language. His data were interesting, but many came away with questions about the study and its methodology. "Reading by Touch: Trials, Battles, and Discoveries" was the title of a presentation by Dr. Pamela Lorimer, a researcher and author from England. She has written a book by the same title, published by the NFB. She reviewed the history of the evolution of Braille and concluded her remarks by commenting: "I am convinced that the Braille code not only has a history but also a future," a sentiment shared by her audience. The next convention item was "Report from the American Foundation for the Blind," by Carl Augusto, president of the AFB. He reviewed the warming relations between our two organizations and reported on recent activities of the AFB. He also presented to Dr. Maurer a bottle of French champagne to be opened when the Instructional Materials Accessibility Act is signed into law. Dr. Maurer accepted it with thanks and said that he would wait until they were together to drink it. The final item on the morning agenda was titled, "Blind Actress Performs on �Rugrats.'" It was presented by Dionne Quan, the voice of Kimmy Finster on the popular children's program, "Rugrats." She told her story of struggle to independence as a blind person and blind actor. Her story was punctuated by comments by Kimmy and her other child characters, which delighted her audience. Dionne was a poised young woman, clearly dealing with the issues that face all blind people and doing so in a very unusual environment. Her presentation charmed the audience. With this presentation the morning session recessed, and delegates scattered to many different activities. 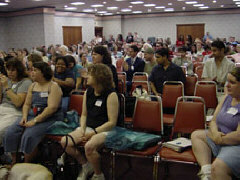 The 2002 Job Opportunities for the Blind Seminar took place that afternoon, as well as a Social Security seminar and a group of workshops for parents and teachers of blind children. In addition to the tours, Federationists could attend receptions and even take in a video-described movie. 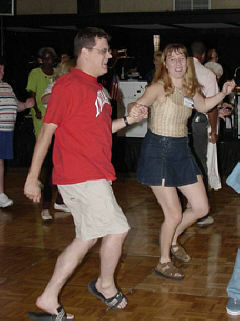 Committees and divisions scheduled meetings during the evening, and the National Association of Blind Students sponsored its Monte Carlo Night filled with games and fun. On tour day in 1985 a large contingent of Federationists enjoyed an evening trip on the Belle of Louisville, the paddle wheel steamer docked on the Ohio just outside the Galt House. During that tour a group wrote the words to our popular song: "Let's Go Out to the Airport." This year the paddle wheel tour adventure was entomological rather than musical. The mayflies, which hatch along bodies of water in the Midwest and then live for only twenty-four hours, chose this evening for their mating dance, and millions of them chose the Belle of Louisville, which of course was sailing up the Ohio, as the location for their one evening of life. The result was a memorable experience for those who met the mayflies. Erik Weihenmayer stands with his arm around Maurice Peret. Monday morning we launched into the most crowded agenda of the week at 9:00 a.m. with an exciting address by our own Erik Weihenmayer titled "Six Up and One to Go." Erik recalled some of the high points of his earlier continental summit climbs and reported on his most recent successful effort, Mt. Elbrus in Russia, which he and his team climbed in early June. For a change of pace Erik skied down the top 10,000 feet of the mountain after reaching the summit. The first part of that route was survival skiing, fighting elevation sickness. The final section was through almost perfect deep powder, though in virtually white-out conditions. Erik was obviously stimulated by the adventure, but his description made it sound formidable. We were proud to have been a sponsor of this climb and of the Everest expedition a year ago. Jim Sanders, president and CEO of the Canadian National Institute for the Blind, spoke on "The Blind of Canada Seeking Equality." He reviewed the founding and evolution of the CNIB and described current efforts to ensure equality for blind Canadians. 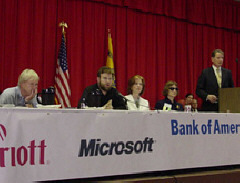 "The Right to Cast a Secret Ballot: Accessible Technology for Everybody, Including the Blind" was the next topic considered by the convention. Three presenters contributed to the discussion: Linda Lamone, state administrator, State Board of Elections for Maryland; Walden O'Dell, chairman of the board, president, and chief executive officer of Diebold, Inc.; and Robert Ney, chairman of the Committee on House Administration, United States House of Representatives. Ms. Lamone reported that in Maryland 40 percent of the electorate will be able to use accessible voting machines this fall. She urged us all to pass the NFB model technology legislation in our own states because officials are unlikely to make accessible voting a priority until they are forced to. She also urged us to work on encouraging Congress to pass federal legislation to help states pay for accessible systems. Mr. O'Dell spoke with great energy about Diebold's efforts to create technology enabling everyone to perform those functions independently. He urged us to advocate for every voting machine purchased in the future to be accessible. Diebold technology has become more useful to blind people precisely because of the partnership established between the company and the NFB. Congressman Ney thanked the NFB for its support from the beginning for nonvisual access to voting machines. He reviewed the history of the effort to pass the legislation that will protect this right and pledged his commitment to seeing that blind Americans achieve the secret ballot as quickly as possible. "Accessible Web Applications and the Implications for the Years Ahead" was the title of an exciting presentation by David Greco, CEO of SSB Technologies. He explained that his company is dedicated to making the Internet a comfortable place for everyone to live. Its founders have developed a program called InFocus, which enables a Webmaster to determine how accessible a Web site is to all sorts of users with unusual physical or learning requirements. SSB Technologies and its competitors can determine whether a Web site complies with existing legal requirements, but they cannot assess whether blind people will actually find it functional. He therefore announced the establishment of the NFB's Nonvisual Web Accessibility Certification, which will assess Web sites for actual usability and then provide a seal certifying that the site is usable. Brochures about the program are available from Allison Joyce at the National Center for the Blind. Jim Fruchterman, president and CEO of Benetech, reported to the audience on "BookShare: The Project for Creating Accessible Books Through Computers." This is one of the most exciting new advances for blind people using the Internet, and it harnesses the skills of everyone who scans books for personal use or use by blind people close to them. The copyright laws now allow us to share these texts through the Web as long as we promise not to pass the downloaded texts along to those who do not qualify to use alternate-format books. These texts are not flawless, and they do not have charts and graphs, but, if someone else has already scanned the book, it is certainly a blessing not to have to scan it for personal use. Ten thousand books are already on the Web site. Applying for service is easy to do. Just go to <www.bookshare.org> and sign up. The final item of the morning was a report from Allen Harris, director of the Iowa Department for the Blind titled, "Kindling the Dream of Independence for the Blind in Iowa." He reviewed the history of the program in Iowa from the point when Dr. Jernigan was appointed. Then he explained the way he was hired. The demands and pressures on state services for the blind are growing across the country, but the Iowa program remains true to the conviction that excellent training and equal opportunity must be founded on healthy attitudes about blindness if blind people are to move forward. The afternoon session opened with remarks titled "Speechio, a Revolutionary Reading System for the Blind," by Satoshi Mizoguchi, inventor of Speechio, and Kazunori Notoya of Kosaido Company, manufacturer of Speechio. They described this system, which can place almost a full page of printed material in an array of tiny dots about the size of a postage stamp. When a page containing such a code is placed in a special reader, a blind person can access it easily. This system has been used with some success in Japan and may have a promising future in the United States. "Research and Future Opportunities for the Blind" was the title of an address by Dr. Fredric Schroeder, executive director of the Professional Development and Research Institute on Blindness at Louisiana Tech University and research professor at San Diego State University. The text of this address appears elsewhere in this issue. Dr. Betsy Zaborowski, NFB director of special programs, made the next presentation: "Research on Blindness: By the Blind for the Blind." She looked ahead over the next several decades and speculated on the kinds of research that we may engage in at the National Research and Training Institute for the Blind. Bob Root, partner, ORION Learning International, Inc., drew on his knowledge of scientific research and the methods used by inventors to make educated guesses about what will be possible in the blindness field in the next few years. His title was "Imagination Makes the Future." "The Future of Rehabilitation: Building Partnerships with Consumer Organizations" was the title of remarks by Dr. Joanne Wilson, commissioner of the Rehabilitation Services Administration. The text of her speech appears elsewhere in this issue. We next heard a stirring address by Kevan Worley, president of the National Association of Blind Merchants, on the subject, "The Randolph-Sheppard Program: Offering Employment Opportunity for the Blind." Without ignoring the problems that beset the Randolph-Sheppard Program, Mr. Worley argued that the future is bright for those who choose this employment opportunity and are prepared to work hard and participate actively in the National Federation of the Blind. David Chu, undersecretary for personnel and readiness of the United States Department of Defense, then spoke about "Employment for the Blind: Working at the Department of Defense." He reported that the Department hopes to increase the number of its disabled employees from 1 percent to 2 percent of its work force. Its program for getting access technology and other accommodations to disabled workers is among the best in the nation, and following the passage of Section 508 of the Rehabilitation Act, the Department of Defense is working hard to see that its Web sites and other sorts of technology are readily usable by disabled employees and their disabled family members who need to use them. The final presentation of the afternoon was a complete surprise to many of us. United States Secretary of Education Rod Paige made an appearance and spoke about the Bush administration's commitment to "leave no child behind," including blind children. He spoke warmly of RSA commissioner Joanne Wilson and assured the group of his department's commitment to helping disabled adults get back to work. Monday evening thousands of Federationists made their way through a sea of tables to find their seats at the annual banquet of the National Federation of the Blind. Fred Schroeder was the master of ceremonies. The festivities began with door prizes, division drawings, and some group singing led by the Sligo Creek Digital Communications Consortium, whose members were Debbie Brown, Lloyd Rasmussen, and Tom Bickford. On behalf of the International Braille Research Center, Harold Snyder then presented its Louis Braille Medal to Dr. Pamela Lorimer; and Nadine Jacobson, president of the National Association to Promote the Use of Braille, presented the division's Golden Keys Award to Debra Bonde, founder of Seedlings Braille Books. These two ceremonies appear in full elsewhere in this issue. The high point of the evening was, as always, President Maurer's banquet address. It was titled "Leadership and the Matrix of Power." The entire text of this stirring address appears elsewhere in this issue. Dr. Ray Kurzweil, called by one convention speaker a "serial venture capitalist" but known to us as a dear friend and the inventor of the first effective reading machine, addressed the banquet audience briefly following Dr. Maurer's speech. His theme was the critical importance of our new Research and Training Institute at this point in history. Peggy Elliott next presented the thirty scholarships, and Anil Lewis, the winner of the $10,000 Kenneth Jernigan Scholarship, addressed the convention briefly. See the report later in this issue. Nearing the close of the festivities, Allen Harris presented the Newel Perry Award to Dr. Daniel Reneau, president of Louisiana Tech University. Then Dr. Maurer presented the Jacobus tenBroek Award to Sharon and Al Maneki of Maryland. Both presentations appear in full elsewhere in this issue. The closing item of the banquet agenda was the presentation of a prize of $1,792, which everyone will recognize as the date that Kentucky became a state. With that the audience adjourned to the after-banquet party, though perhaps the most sensible folks retired to bed in preparation for the Tuesday business session, which as always began on time. The morning session was devoted to various financial and fundraising reports and the honor roll call of affiliate and division gifts and pledges to several funds of importance to the organization. Jim Gashel and Jim McCarthy of the NFB Governmental Affairs Department then gave their annual report of pending legislation and needed action in the coming months. Then there's that junk mail and bills I must pay. Since I can't see, I won't do that today. I went to the doctor who said I am blind. "Be glad it's your eyes and you didn't lose your mind!" Now I am learning all kinds of new things. This is the joy independence will bring! And now I don't feel so bad. Debating and voting on resolutions took the entire afternoon session, but by the time of adjournment the crowd was still capable of a final enthusiastic Federation cheer, which brought the 2002 convention to its triumphant close. The coming year will bring much challenge: the first Meet-the-Blind Month, our continued effort to fund and build the Research and Training Institute, important legislation to pass, lawsuits to win, and individual blind people to rescue from despair: these things will require boundless energy and dedication. We left Louisville grateful for the laughter and fellowship, the inspiration and information we had received, and ready once again to take up our task of changing what it means to be blind.